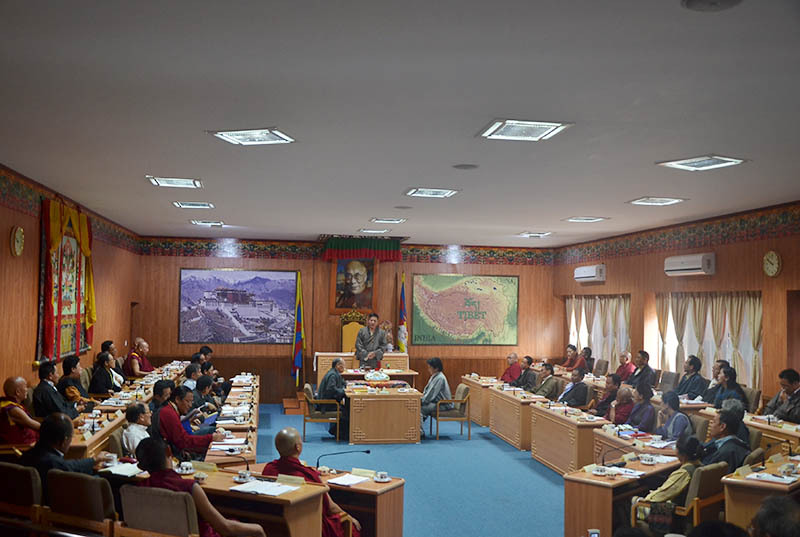 (TibetanReview.net, Sep26, 2015) – The 10th and penultimate session of the 15th Tibetan Parliament-in-Exile concluded on Sep 25 afternoon with the members having mainly discussed the annual reports of the different departments of the Central Tibetan Administration as well as the parliament’s committee reports. The end of the parliament session also saw followers of the Jonang tradition of Tibetan Buddhism suspending their protest outside the parliament. Followers of Jonang, a small but distinct tradition of Tibetan Buddhism, have been demanding equal share of representation with the major religious traditions, including separate parliamentary seats, in all exile Tibetan institutions and around a hundred of them had been protesting outside the parliament since the just-concluded session began on Sep 15. Nine of them had been sitting on a hunger-strike since Sep 17 when the Jonang Well Being Association presented a seven-point demand to the parliament. Following a closed-door meeting, the parliament accepted four of their demands, namely for the allotment of same number of seats with the major schools during special meetings, the allotment of same number of seats with them during religious meetings, teaching about the Jonang tradition in Tibetan schools, and the provision of equal number of seats with the major schools in the Tibetan Buddhist scholars committee. As regards the reservation of seats in the Tibetan parliament, the matter was debated and put to vote during the previous session but defeated. The matter was also put up for discussion during the current session but no one took it up after the protesters had staged raucous protests and jostled a member who had spoken against the reservation during the previous session. Now, Mr Tsangyang Gyatso, the President of the association, has explained that the group was temporarily calling off its protest on the advices of the Gaden Phodrang (the office of His Holiness the Dalai Lama), the Kashag, the Tibetan Parliament and on desires expressed by devotees of the tradition.